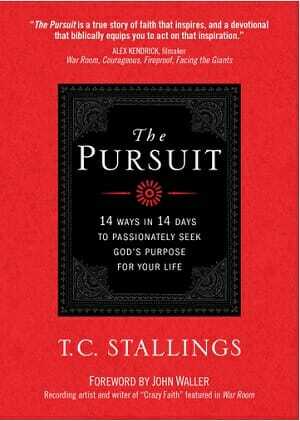 The Pursuit: 14 Ways in 14 Days to Passionately Seek God’s Purpose for Your Life is one of the best books you will read as it concerns discovering your life purpose. 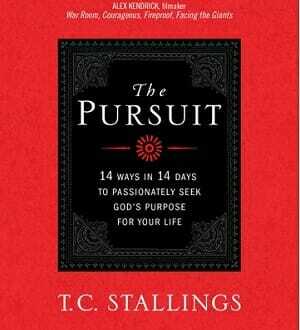 The author TC Stallings, a former professional football player and actor who played the lead role in the Kendrick Brothers movie War Room shares his journey in discovering God’s purpose for his life and lessons on how you can do the same. Before you were even created in your mother’s womb God had already ordained you for a certain purpose here on earth. That’s how much He knows and cares about you so much so in that your life’s beginning and end is already scripted. You don’t have to go through life wondering whether or not you were created for great things. Success in life comes in part through discovering God’s purpose for your life. Since God is the author of your life you must seek Him in prayer and meditate on His word to discover your purpose. I once heard a speaker say there are two important days in your life i.e. the day you were born and the day you discover why. Discovering why is a massive first step to living a great life. Reading through TC’s story to becoming who he is today you will find out that you can’t make your own plan and expect God to bless it. Some of the teaching about purpose today is erroneous which teaches that you can be anything you want to be as long as you put your mind to it. What often happens when you’re doing things your own way is that you become frustrated when you don’t achieve success. Even if you think what you’re doing is good and can be a blessing to other people doesn’t matter. God is specific about what He wants you to do. In the context of God’s purpose for your life you can become all that He created you to be when you put your mind to it. As long as your life’s pursuit is ordained by God you will have assurance that the journey will be blessed. Since there’s already a blueprint of God’s purpose for your life and all you’re required to do is follow it then you can be sure of success. It doesn’t mean it will be smooth sailing but you will have the confidence that great success is definite. You will come across obstacles along the way and you may have moments where you feel like you’re not going to win. In TC’s story it’s only when he decided to surrender his will for God’s will that his life became a blessed pursuit. The devotionals he shares in this book are his recipe for success that he wants you to adopt so that you too can have guaranteed success in life. Today TC Stallings lives a fulfilled life by touching people’s lives through acting and speaking to various audiences around the world. When he speaks about his own life you can tell that he is happy and has peace of mind knowing that he’s walking in God’s purpose. We are told in the word of God that the just shall live by faith. Faith comes by hearing the word of God and trusting that God will be true to His word no matter what the circumstances. All successful people that I know have taken many leaps of faith in the direction of their dreams. God gives you enough to work with where you are otherwise you may never get started. At various points of your life’s journey you must take steps of faith and you will see God meeting you at your point of faith when you do. Growth or progress never happens in your comfort zone as you might have learned in your life’s journey. You don’t get to see what God has in store for you unless you step out in faith. As with TC you may get to a point where you have nothing left to hold on to but Jesus. Have faith that He has your back when you’re pursuing His will. As long as God has declared something will be done there’s nothing or anyone that can stop it, not even Satan. Satan knows that he’s defeated already and his purpose is to bring you along with him. He is doomed to eternal condemnation and he wants to bring other people along with him by getting them off course. Knowing this should be an encouragement to you. There are people that blame the devil for their life’s shortcomings yet this is not true. Satan does throw obstacles in your way but you always have a choice to overcome them or allow them to get the better of you. If you’re aware of the enemy’s devices and know who you are in Jesus Christ then you have the upper hand and can defeat Satan. Problems arise when you either don’t know the devil’s ways, your identity in Christ or both. To be a successful person in your life’s journey you must use your authority as a believer to overcome the devil. Obedience to God’s commands must be your top priority. Most people believe that they will go to heaven because of their good works and that is one of the devil’s big deceptions. You can feed the hungry, clothe the naked and all sorts of things but neglecting God’s purpose for your life will leave Jesus no choice but to deny you on Judgment Day. Again you can’t justify your plan by saying you will use it to advance God’s kingdom. You may bless people in the process of doing so but it will count for nothing in eternity because it wasn’t part of God’s plan for your life. Remember King Saul lost the kingdom to King David even though in his own mind he thought he was doing a good thing by pleasing his people. Have these few lessons been helpful? Be sure to let us know how in the comments below and to get yourself a copy of the book for more.